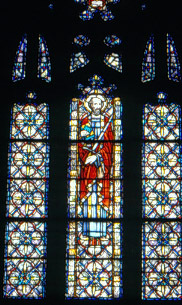 Brief Description of Subject: The center panel depicts a figure holding a sword and a Bible. The side panels are ornamental. The peak depicts an Open Bible inscribed with “Spiritus Gladius” and behind the Bible is a sword of the Spirit, cross-hilted.